You�re getting annoyed with slipping as you ride, tire scrub has become an issue that you don�t want to deal with, and most of all (if you�re like us) you HATE losing traction and power when you�re out tearing up the trails. We�ve all experienced it. Wet grass, snow, gravel, and loose dirt are nuisances that we get tired of dealing with. But no longer! All thanks to our UT Custom Posi Differential. Our focus shifted and we began to make Catrike quads and (a favorite of many) the FatCat quad. At first we used the Samagaga differential, and then asked them to create a more custom version of their ETG model. This custom version functioned like our original double free wheel design, only it used an internal free wheel mechanism that worked well on our standard quad. But then the custom FatCat quad rolled onto the scene, and even this custom Samagaga differential couldn�t handle it. The FatCat was bigger, better, and badder than anything we�d created and the small free wheel mechanisms couldn�t handle the power needed to turn those giant tires or the rigors of offroad riding. We tried going back to a standard geared differential, but riders still encountered issues. Our solution that trumps all solutions is our brand new UT Custom differential. It�s a differential that works in different scenarios, it�s user serviceable, and we�ve made it more robust to handle the extreme off-roading that you all enjoy so much. 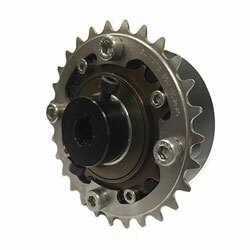 A differential is a device that allows power to be transmitted to both rear wheels. When you make a turn on your trike, the wheel on the outside of the turn has to cover more ground. If you�re driving both axles together, one of the wheels will slip or scrub on the ground. A differential allows the wheels to be driven at different speeds. The free wheel style of our custom differential allows the outside wheel in a turn to spin freely and catch up to the inside wheel, avoiding slipping and scrubbing. Our design features a standard 20-tooth free wheel with a bolt-on chain ring. The whole unit can be taken apart and rebuilt or serviced, instead of having to replace the whole thing if, for some reason, it malfunctions. We also chose to use a single standard free wheel for each axle, making our differential twice as strong and capable of handling the power of the FatCat. It can be installed on our custom quads and delta trikes so that you can get more traction and more control while you ride.